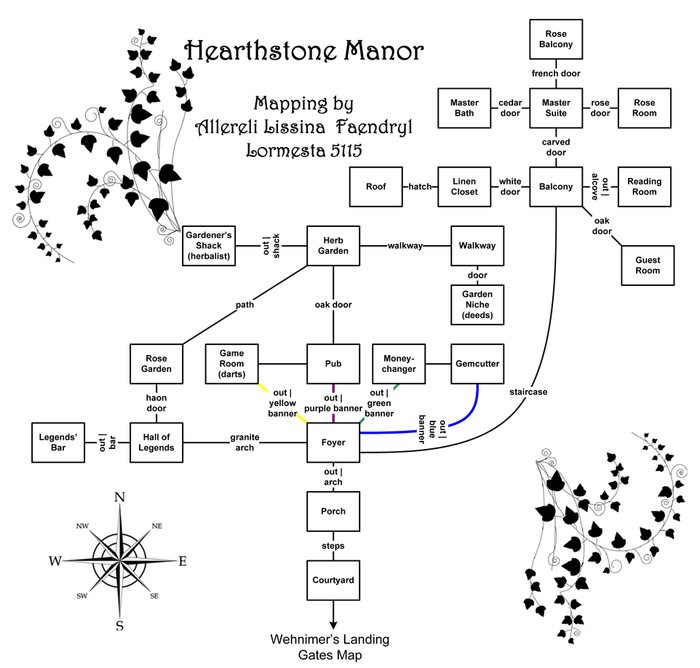 Hearthstone Manor is located just north of Wehnimer's Landing. It was built by Lord Kerrington Ravenhearth to provide shelter for the famous adventurers of Elanthia. Only characters with about 200,000 fame or higher than about level 20 may enter. The porch was once a popular resting spot open to everybody and known to attract story tellers. Hearthstone contains a game room with darts, two bars, a bank, gemshop, herbalist, deed puzzle, and two super nodes. Upstairs there are a few latch-able rooms. Ayana leaf can be foraged for in the various garden rooms. The herb garden contains a shrine to Kuon. The Legends Bar holds a record of the first characters of each profession to reach level 50 in GemStone III. The Paladin and Monk goblets mark the first respective players to reach level 40 in GemStone IV. This page was last modified on 13 September 2018, at 09:28.